CNXSoft: Ray reviews Amlogic S812 powered Linux based KowanTV Click TV box with allegedly access to over a thousand free IPTV channels. While the hardware is pretty standard, you pay a (hefty) premium to access their IPTV servers, and it reminds me of Jynxbox Live which I reviewed a few years ago. I received one these rare Linux stream boxes. 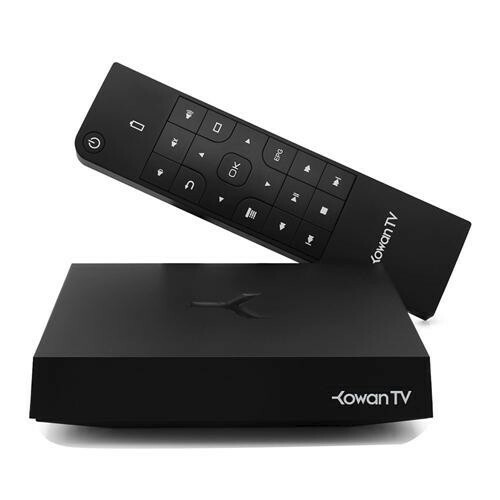 It’s called TVone Entertainment hub, advertised as: KowanTV Click To Play Entertainment Hub European American TV Channels Live Broadcast Video on demand IPTV BOX 1000+ Free Channels, and provided by GeekBuying for this review. After opening the package, we see the top of the box and the fancy looking RF remote, covered in soft foam, a USB 2.0 to Micro USB (1 meter), and a HDMI cable v.1.4 (1.5 meter) together with a quick setup manual and the power supply. On first sight, all looks from high quality in a straight forward design. But stay tuned, this box will show some surprises. One of the big “advertisements” of this box is, that it would come with a preload (or after OTA updates) of over 1000 Channels. 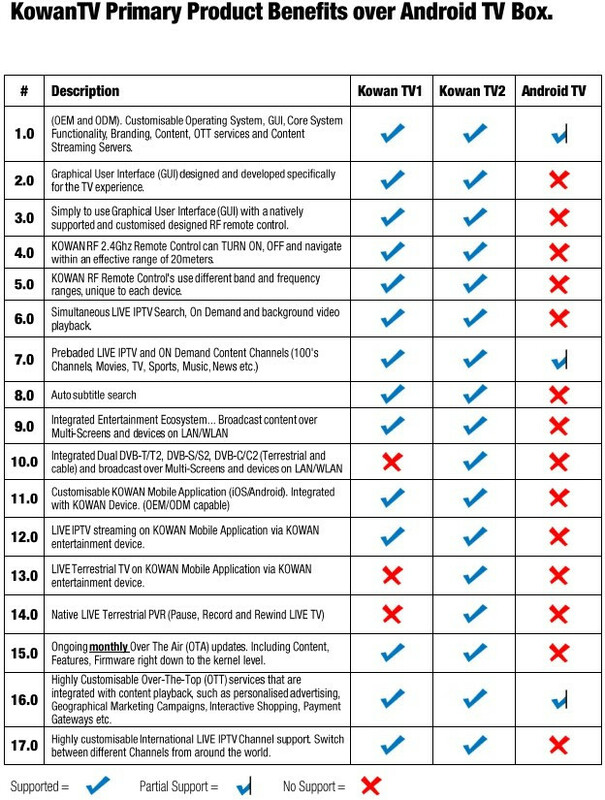 The company also provided a comparison table showing differences with “standard Android TV boxes”. 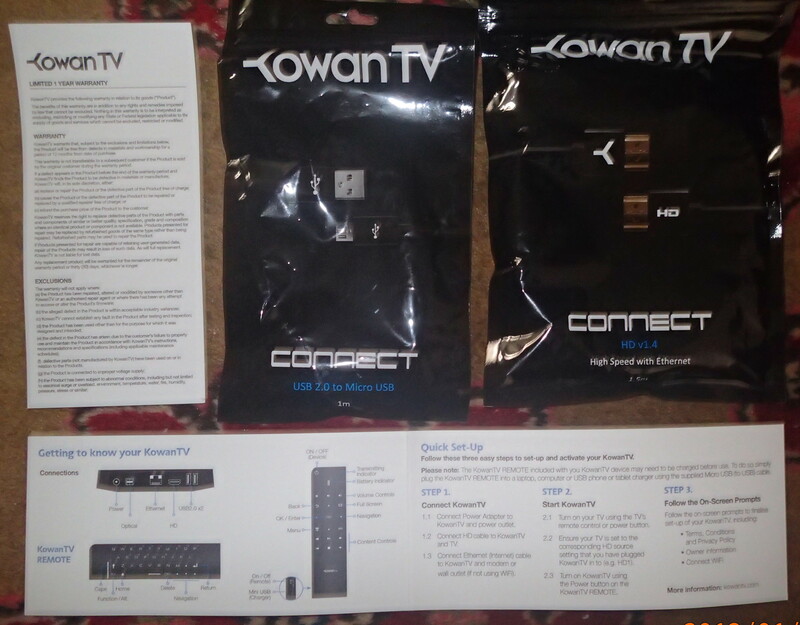 Kowan TV1 is the box being reviewed here, as Kowan TV2 also include dual DVB-T2/C & DVB-S2 tuner. 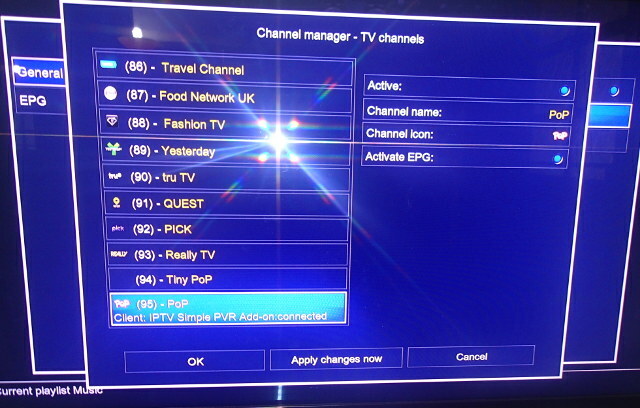 Surprisingly the number of TV stations after my first connection was just 95 channels. I got suspicious and tried to figure out, what’s really behind the Kowan TV1! The firmware is simply a kind of modified Linux/Kodi Modification, similar to Arnubox Mach 10 Pure Linux! 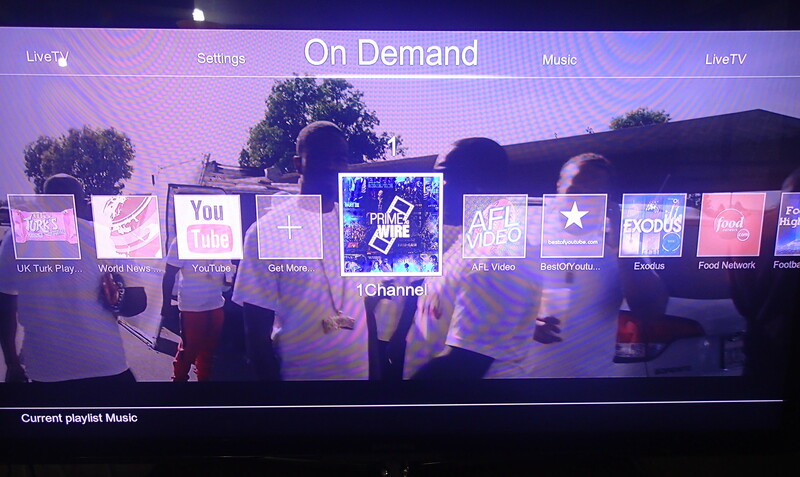 A mixture of renewable OTA TV links and a integrated Kodi styled Addon GUI. It reminded me directly of my bad experiences with Arnubox Mach 10, with similar specifications, also using Amlogic e S812 ARM Cortex-A9 processor with an octa-core Mali-450MP GPU. I tested the quality of the “live links” and it was a new experience. Never ever before I saw streams such bad video streams, almost all in a range between 500 and 800k, meaning they are not watchable on big screens at all. Most streams are delivered by FilmON add-on. I connected 3 different brands of Wireless mouses without success, and even Mele F10 Deluxe did not work. Then I tried a standard USB keyboard, no success either. This box only seems to work with the original remote, a handicap what could be fatal one time. KOWAN TV1 Linux seems like a promising system. It shows great performance, but I also experienced issues with connecting built-in Kodi addons to servers (both through Ethernet and WiFi), signing-in into YouTube, some add-ons did not work, and the remote control was useful but quite flawed. The biggest disappointment was, that this box delivers the advertised “over 1000” channels only by using pirate Kodi addons only. As I mentioned previously, I also manged to get 95 live channels, and half of them would not even open because of endless pre-buffering, so it was more then disappointing. On the bright side, this “Kodi machine” has good picture quality, and managed to play almost anything thrown at it (within Amlogic S812 chipset limitations – no TS files). Local network performance proved to be quite good, though with long pre-buffering for heavy 4K content. 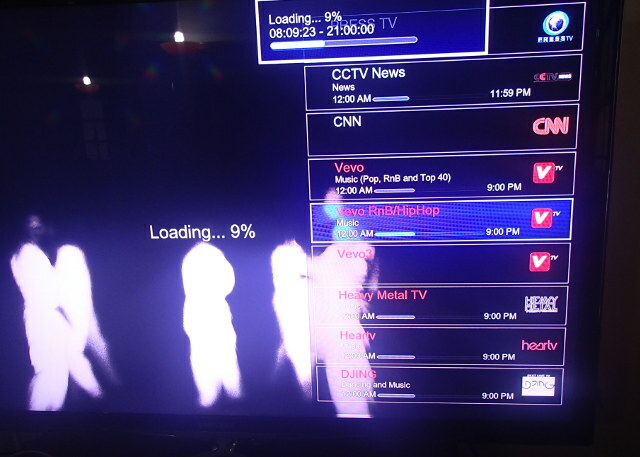 There are also some services reminiscent of the old NMT (network media tanks), which allows things, like torrent download and playback, and other interesting options. Entertainment systems running on Linux never really made their way to the end consumers in the past through their handicap to be married to Kodi only somehow. More successful Linux boxes, such as the Mag boxes, use different middleware offering end users a simple way to connect to a IPTV portal. I wish Kowan TV1 would have gone this way in compiling a real hybrid able to run a nicely done GUI with Kodi together with portal compatibility. 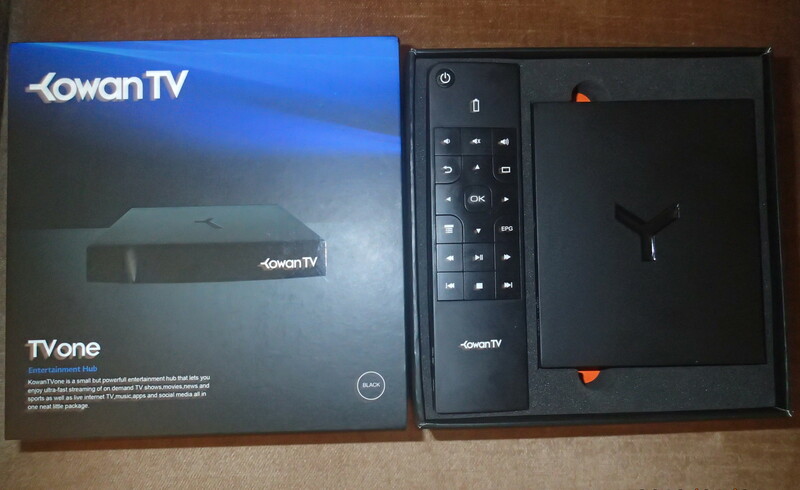 This would have made it a real unique box with potential, and not ending up being an overpriced Kodi Entertainment System, although the name Kodi does not appear at all in the the modified GUI. The specifications are about the same as any of the other Amlogic S812 based boxes out there, and the main difference remains the operating system. The manufacturer markets the box as better than its Android counterparts, but I found it to be a mixed bag. The default skin that was custom made for the box, requires some getting used to, if you are used to the standard confluence Kodi skin. But it works quite well, If you come from Android, or even Windows boxes, this Linux box will require some adjustments. It might be the right fit for you, but you will need to know that it’s Kodi only, and there is nothing else, no matter the modified GUI, which is on the other hand, an improvement to standard Kodi systems, for an inexperienced or older user. Did I like it? Not really. I was disappointed with some of the issues I found as my expectations were higher for a dedicated box. Would I recommend it? I would, but only for people with limited technical understandings and who just need a capable kind of Entertainment/Kodi box, and are willing to live with its limitations, and extremely higher than average price. GeekBuying kindly provided the sample for review, and if you still want to purchase it, you can do on on their website for $199 (No typo). Free shipping and a free Tenda F3 N300 wireless router somewhat soften the high price tag. It can also be found on Aliexpress and eBay for the same price. So if some one installs Kodi from Google play, and FILMon live，Mobdro (external source) and Viewster, Planet Knowledge on their Android box. They are halfway there? Good question and i would say, YES! indeed the full way you would be there! Do the included tuners in these boxes support terrestrial NTSC Broadcasts? Is there PVR/DVR software included? Afaik no, NTSC is analogue while DVB stands for Digital Video Broadcasting. Equivalent for DVB in US/Canada is afaik ATSC. I agree with @Stane1983 for the first question..
For the second one: all boxes with tuner that I have tested also support PVR function. $40 coupon: PSDBNTDL for Kowan TV1.